You can export RezStream Professional financial and transaction data into QuickBooks. This can be very helpful in eliminating manual entries into the QuickBooks system. Before you attempt to export your data, please read the notes below and then carefully read the QuickBooks Configuration guide followed by the QuickBooks Export guide. Other versions may be compatible but are not officially supported. The version you are using must have the ability to import IIF files. The QuickBooks export works only with the accrual basis method of accounting. Cash basis accounting is not supported. As a result any report in QuickBooks should be generated as an "Accrual" report instead of a "Cash" report. For best results, you should create a new company in QuickBooks before attempting an export. RezStream Professional will only match certain accounts with QuickBooks, namely your bank deposit and tax liability accounts. All other accounts, including Income accounts, will be created on the first export. Information is exported as line items, not as a summary amount. You can summarize the data yourself within QuickBooks or use one of the many reports included with RezStream Professional. An income account is created in QuickBooks for each different income item (e.g. POS items and individual units). Please see the QuickBooks Export topic for more details. RezStream recommends exporting data on a monthly basis. This is typically done after all payments are received and other changes have been made to your RezStream Professional data. You may export data more frequently, but monthly exports are easier to understand. It is highly recommended that you do all editing of customer transactions within RezStream Professional for the month you wish to export, (deleting reservations, editing payments, adding additional POS items, etc.) before you export data from RezStream Professional into QuickBooks . If you do this, you will not have to go back and correct entries exported to QuickBooks if you wait to do the export until any last minute changes are done in RezStream Professional. You cannot export today’s data unless you have set the audit time in RezStream Professional to a time earlier than midnight. Unless you are exporting after this audit time, your export must be done through yesterday's date. Please see the section on QuickBooks Configuration Settings for more information on setting the audit time. RezStream cannot provide any support for QuickBooks beyond the export process. Any questions about how to interpret data and reports within QuickBooks should be directed to Intuit. QuickBooks and Intuit are registered trademarks and property of the Intuit Corporation. We are not affiliated with QuickBooks and Intuit in any manner. All QuickBooks tech support questions should be directed to that company. The QuickBooks export works only with the accrual basis method of accounting. Cash basis accounting is not supported. For best results, you should create a new company in QuickBooks before attempting an export. RezStream Professional can only match certain accounts with QuickBooks, namely your bank deposit and tax liability accounts. All other accounts, including income accounts, will be created on the first export. Step one in configuring the QuickBooks export is to determine the name of your bank deposit and tax accounts. Before exporting any data from RezStream Professional, check your QuickBooks chart of accounts list for the accounts listed below. If they already exist, you will need to confirm that the account name and type matches the account names and types listed here. If they do not, you will need to first rename your current accounts in QuickBooks to a slightly different name or you will not be able to import a RezStream Professional export. If the account names already exist and the type matches, you do not need to change the names unless you want all new imported entries to go into an account different from the existing account. Create your new business account in QuickBooks. Do not create individual account names; they will be automatically created on the first import. If the account names already exist and the account types are different, the import will fail. 1. Navigate to the Reports screen (F7) and click File > QuickBooks > Configure. Note: The configuration settings should not be changed once you have imported any RezStream exported data into QuickBooks. If you change tax payment agency names or bank account names after you have done previous export/imports, you will end up with duplicate accounts in QuickBooks with slightly different names. You will see two date boxes as pictured in Step 1 below. The first box (on top) establishes the last date that you want RezStream to ignore when it begins transferring data into QuickBooks. 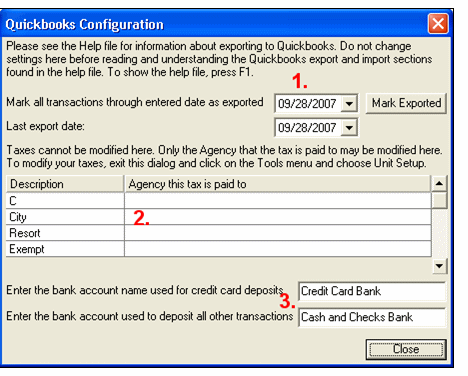 (Example: You manually entered financial data into QuickBooks for August of 2007. You do not want RezStream to export data for August 2007. Consequently, you would enter a date of 8/31/2007 as the cutoff date. When you did an export of data for September, you would not get information for August.) If you are using QuickBooks for the first time, pick a date that represents one day before you started entering reservations and financial data into RezStream. The second box shows the last date you did an export. You do not need to set and change anything in this box. 2. Step two is a list of the agencies that you pay sales tax to. The description column is the individual tax as listed in the Taxes, Discounts section of RezStream Professional. The agency this tax is paid to is the name of tax agency as listed in your QuickBooks configuration. If you have not configured QuickBooks, then simply enter a descriptive name for the tax agency. If two or more taxes are paid to the same agency, make sure that you enter them identically on each line. If you later add a new tax type, you will need to enter the agency name here before doing a new export. 3. Step three is to enter the names of the bank accounts that will be used for recording payments. Important: The names you use for bank accounts should match exactly what you created in QuickBooks. There are two fields for bank accounts: one for credit card transactions and another for all non credit card transactions. If all your transactions go into the same account, make sure the two entries match exactly. RezStream Professional adds all payments to the advance deposits account. Each invoice line item as processed on the date for that line item and the value of the line item plus the value of taxes for that line item are deducted from the advance deposit account. If line items from RezStream Professional transactions are exported into QuickBooks and you have not received payments for those items within RezStream Professional, a discrepancy will exist in the advance deposits account in QuickBooks. Make sure all items in a time period have had a payment recorded in RezStream Professional before exporting data into QuickBooks. If you do not collect payment until a rental has been completed, then do not export a time period that would include any portion of that rental. If payment is collected prior to rental, you may export at any time. Make all changes to past reservations, transactions, payments, etc. within RezStream Professional prior to exporting data into QuickBooks. If you need to change a POS item price or a rental day price, you must do so prior to exporting. Once you set your cutoff date in the first box above, you will not need to come back into this screen each time you export data into QuickBooks. RezStream Professional will automatically keep track of your last export date and only export data from that date until the last date of export that you select when you actually export data. You cannot export today’s data. Only yesterday’s date and earlier time periods are allowed. Remember to make a backup of your QuickBooks data and RezStream Professional data before doing any export. QuickBooks and Intuit are registered trademarks and property of the Intuit Corporation. All QuickBooks tech support questions should be directed to that company. RezStream recommends exporting data on a monthly basis. This is typically done after all payments are received and other changes have been made to your RezStream Professional data. You may export data more frequently, but monthly exports are easier to understand and less prone to error. It is highly recommended that you do all editing of customer transactions within RezStream Professional for the month you wish to export (deleting reservations, editing payments, adding additional POS items, etc.) before you export data from RezStream Professional into QuickBooks. If you do this, you will not have to go back and correct entries exported to QuickBooks if you wait to do the export until any last minute changes are done in RezStream Professional. An income account is created in QuickBooks for each different income item (e.g. POS items and individual units). Please see the "Accounts Created by the Export" section below for more details. The following accounts will automatically be created when you do your first import from RezStream Professional. One for each unit group you have defined. Plus subaccounts for cancel fees, POS and Rental. Plus sub-sub accounts for each POS item and each rental unit. Warning: It is critical to complete the QuickBooks Configuration process before you attempt to export data from RezStream for the first time. Navigate to the Reports screen within RezStream (F7), and choose: File > QuickBooks > Export. Enter the last date that you want to have included in the export file. (Example: 8/31/2007). You will then be exporting data between the data of your last data transfer and the date you choose here. Note: To see the date of your last export into QuickBooks see QuickBooks Configuration. An IIF (QuickBooks Import File) will be created and saved in the C:\Program Files\RezStream folder on your computer. The file will be named with the date and your property name, e.g. 2007Jun30RezStreamInn.iif. Open QuickBooks, and go to File >Utilities > Import and browse to the file that is stored in the RezStream folder on your hard drive. Note: Export files will be named YYYYMMMDDBusinessName.IIF where YYYY is the four digit year of the end date of the export data, MMM is the three character month name, DD is the two digit day and Business Name is your business name as entered in the Tools > Configuration area. IIF is the QuickBooks export/import file extension.